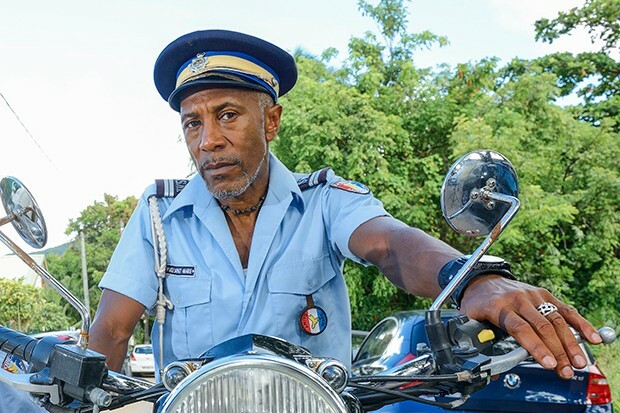 After 7 series and 62 solved murders, four suicides, an accidental death and an unfortunate poisoned cat named Opal, Officer Dwayne Myers, played by Danny John-Jules, is turning in his badge and will be leaving the island of Saint Marie before filming begins on series 8. Considered the most murderous place in the world, the idyllic home for the hit BBC series, Death in Paradise, Saint Marie will be losing it longest standing officer at the Honoré Police Station leaving Commissioner Selwyn Patterson (Don Warrington) as the last original cast member. According to Red Planet Pictures, producers of DIP, John-Jules wanted to ‘leave the show on a high’. The Red Dwarf star has spent seven years filming the drama in French Caribbean island Guadeloupe, with his two young children Danté and Danaè playing minor roles in the show as Jackson and Elize. As evidenced by the earlier departures of Ben Miller (DI Richard Poole), Kris Marshall (DI Humphrey Goodman), Sara Martins (Camille Bordey) and Gary Carr (Fidel Best), filming the series can take its toll on any possibility of an actor’s family or personal life. Both Miller and Marshall cited wanting to leave the show to spend more time with family. Series 7, which has already aired in the UK and has begun running on some public television stations across America, will see DI Jack Mooney, played by Ardal O’Hanlon, heading the island police force for his first full series after replacing Kris Marshall’s DI Humphrey Goodman. Thankfully, Goodman didn’t meet the same tragic end to his Saint Marie run that Ben Miller did. Instead of being ceremoniously killed off, Goodman decided to remain in London with ‘Martha’ after tracking a suspect there and, actually, recommended the recently widowed DI Jack Mooney, the team’s London liaison for their latest case in series 6, as his successor in Saint Marie for series 7. More ‘Death in Paradise’ on Saint Marie coming in 2017! The article is actually incorrect about Don Warrington being the only original cast member left. Liz Bourgine who plays Catherine Bordey, who owns the bar all the team attend in most episodes is still part of the cast and who also has been in the series from the start.